Andrea Marcante set up UdA architecture firm in 1992, where he was joined by Adelaide Testa in 2004. 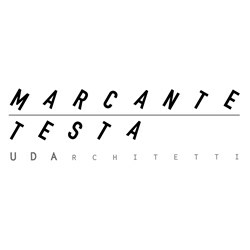 In 2014 Andrea Marcante and Adelaide Testa set up “MARCANTE-TESTA / UdA Architects”, a research oriented firm focusing on architecture, design and company consulting in the field of materials and furniture. Their home interiors are supposed to be both serious and fun, rustic and cosmopolitan, democratic and refined, practical and elegant, manly and delicate: if certain interiors excite us, it is because they are examples of possible choices between conflicting aspects of our personality, of the legitimate aspiration to transform our own disturbing contradictions into something beautiful. In 2016, with “Liberamensa” restaurant, they begin a path of collaboration with the public administration to introduce interior architecture in "weak" places such as prisons.